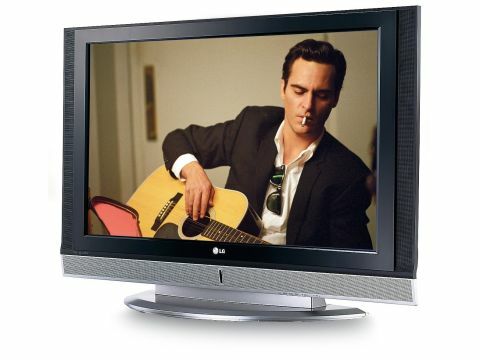 Despite being a 42in plasma TV, LG's 42PC1D really can be had these days for just £630. This was not, of course, the TV's original price. But with LG's new flat TV range starting to roll out, the 42PC1D is now being heavily discounted, resulting in a bargain of near biblical proportions. Your £630 gets you, for starters, a really nicely built TV, with a glossy black bezel that contrasts tastefully with the silver speaker section. It also gets you two HDMI sockets, a component video input, three Scarts, a PC jack, and even a digital audio output. In terms of features, the 42PC1D boasts a digital tuner, along with LG's proprietary XD Engine video processing system for improving colours, noise levels, contrast, fine detailing and brightness. The contrast element is pretty effective if LG's promise of a 10000:1 contrast ratio is to be believed. Also striking for this money is the TV's Clear Filter screen design, which replaces plasma's thick glass filter with a single film to dispense with the 'double image' effect seen on traditional plasma glass if watched from an angle. The 42PC1D is certainly not the best 42in picture performer we've had in the Tech Labs. But we've included it for the simple reason that it's way better than you've any right to expect for the money. The screen's single biggest strength is its colour resolution. If there's a plasma TV out there that does richer, brighter and more vivid colours than the 42PC1D, we can't think of it. Surprisingly, though, this vibrancy isn't achieved at the expense of natural skin tones. Black levels are impressive - by £630 standards. Also good for the money is its freedom from common plasma problems such as fizzing over moving objects and colour striping, and the set's audio talents are perfectly acceptable. Where the TV's budget nature is felt is in the area of video noise, as the picture suffers with MPEG decoding noise with digital broadcasts, and general colour noise. One other concern is that high-definition pictures don't look as sharp as we know they can.